1 Discussion of MEF being applicable to new intersection accessibility designs on steep, hilly sites. Also, for sites where the surrounding road grades do not comply with traditional accessibility requirements, how does that affect accessible intersection design (meaning all roads leading to an intersection do not meet typical accessibility requirements)? 2 It seems that accessible sidewalks in NYC are increasingly in a terrible state, and becoming worse. 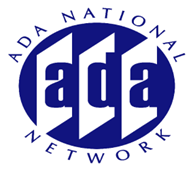 I am from Disabled in Action, a disability advocacy group in NYC. Should we notify the department of traffic about this issue? Is the sad state of affairs all about money? 3 In what way do the guidelines address the prevalence of dock-less scooters and bikes? These are motorized scooters and bikes that individuals can use through a mobile app. After a person rides one and reaches their destination they leave it on the sidewalk, frequently obstructing the walkway. 4 Is a pedestrian pathway required if there is a driveway and people use the driveway to walk up to the building from the street? In this case, there is no sidewalk but everyone uses the driveway to walk up to the building if they are on foot. It is very steep, hard for a wheelchair. Seems like it's a shared use path and should be accessible but they argue its a driveway and not covered/required. What is the distinction if everyone is using it like it is a sidewalk/pedestrian path? 5 Could you please discuss the cross slope of ADA ramps if the street is greater than 2%? Also the differences in cross slope percentages for a controlled and uncontrolled intersection with ramps. 6 Is the DOT/DOJ joint statement that resurfacing is considered an alteration that would require curb ramps to be installed where none currently exist, applicable to current projects if PROWAG has not been adopted? 7 Will you please discuss the current requirements for diagonal curb ramps in 406.6. There are curb ramps that are not quite at the 45 as shown the figure, nor are they 90 degree directional curb ramps: do you need to still provide the additional 24 inches within the markings for these curb ramps? 8 It seems that accessible sidewalks in NYC are increasingly in a terrible state, and becoming worse. I am from Disabled in Action, a disability advocacy group in NYC. Should we notify the department of traffic about this issue? Is the sad state of affairs all about money? 9 Does the entire area between the face of curb to the building have to meet accessible requirements if it is paved as sidewalk? If, in an urban setting, multiple utility vault covers exist in the pedestrian zone, do those vault covers need to be raised, placed in “non-pedestrian” planting beds, or guards proposed around them? Is there a distinction in the pedestrian zone between circulation paths and accessible routes, similar to plaza scenarios? Mostly, I’m curious what options do designers have when dealing with large expanses of sidewalk, if those sidewalks must comply with the maximum cross slope requirement of 1:48? 11 Can you discuss how to measure a curb and gutter to objectively determine whether it complies with the 1:20 interface requirement. I have heard where both sides are measured and if the slopes add up >X then it doesn't comply. 12 If sidewalks are created, could you include getting the street paved as well? 13 Can you discuss how to measure a curb ramp and gutter to objectively determine whether it complies with the 1:20 counter slope (406.2) requirement. I have heard where both sides are measured and if the slopes add up >X then it doesn't comply. Will FDOT provide more guidance on curb and gutter styles? 14 Under what circumstances, if any, is a shoulder considered a pedestrian access route and thus subject to ADA requirements for pedestrian access routes? Would it require the presence of some kind of signage designating the shoulder is for exclusive pedestrian use, like "Ped Only" pavement markings or the MUTCD's sign W11-2 paired with a no-parking sign? I feel fairly certain that I don't have to worry about meeting accessible cross-slopes for a shoulder on a rural mountain road with significant super-elevations, but in suburban areas, the lines between sidewalks and shoulders can get blurred at times, so any advice you can offer is appreciated. 15 Please address typical challenges when a shared use path crosses at a signalized intersection. PROWAG conditions for Shared Use Paths include providing a curb ramp for each crosswalk direction [R207.1] where each curb ramp is 10-feet wide [R304.5.1.2], and obstructions in the PAR are not allowed (signal poles, bollards) [R302.3.2]. Is it okay to put signal pushbuttons in the sidewalk? Where the path is not buffered from a road by 10'+, the curb ramp will cut into the path width. Is that okay? Alternatively, if a diagonal curb ramp is used [ADAAG 406.5], a 2-foot segment of raised curb on each side of the flare is required. When the curb ramp is 10-feet wide, this doesn't fit in the crosswalk markings. Okay to omit the 2-foot straight curb? 16 Do existing non-compliant driveways have to be replaced when sidewalks next to it are replaced or new sidewalks installed? When sidewalks are replaced or installed, and curb ramps are incorporated onto the design of the driveways, do these curb ramps serving unsignalized and signalized driveways require detectable warning tiles? 17 Can you provide an update on PROWAG rulemaking and any new information related to the formal adoption of these guidelines? A lot of dates have come and gone. Is there anything you can share about why this rulemaking has been so difficult to finalize? 18 R309.2.1 discusses wide sidewalks and parallel parking. This seems to be a point of consternation between cities providing on-street parking on their ROW vs. Owner's sidewalk. 1) Are cities currently installing the 1 per 200 on-street parking spaces (since PROWAG isn't adopted). 2) Please explain how the Advisory R309.2.1 is to be implemented as to how people park. The condition I see is the 11' sidewalk and the 8' parallel space. 19 At a stop-controlled T-intersection crossing with no striped crosswalks (stop-control on the minor leg only), must ramps be provided to allow for each potential pedestrian crossing (i.e. ramps provided to allow crossing on the stop-controlled leg, as well as ramps provided to cross legs with free-flow traffic)? 20 Can you expound upon the Uber driver impact for pick-up/drop off ride services and the need for accessible loading/unloading zones. Buildings are creating interior secure Uber Lounges to wait. Does this require an accessible drop off/loading zone? OR can an accessible parallel parking space be used? 21 R 104.2 (ADAAG) and R103.2 (PROWAG 2011) allow for rounding percentages down for values less than one half. In a hypothetical overlay project where an altered crossing is served by an existing ramp with a measured cross slope of 2.4%, would that ramp have to be replaced (assuming it is technically feasible to do so), or would the value of the measurement be rounded down to 2%, making it compliant? Would the same rounding rule apply to recently constructed ramps that are being measured prior to accepting the contractor's work? 22 Please address Accessibility Guidelines X02.4.1.2 Corners. Requiring ALL corners of an intersection to provide curb ramps or flush landings, if any of the corners are served by a public sidewalk or pedestrian access route (and the whether or not served by a crosswalk. If a City jurisdiction is making infrastructure repairs to the streets (including mechanical, drainage and resurfacing), are they responsible for modifying every corner within the scope of the project, regardless of sidewalks or signals? And is this Federal law, or a suggested design guideline? 23 Live in well established area of Hillsborough County outside Tampa. We have sidewalks but are too narrow to walk with my service dog. Although not everyone pleased, dog eliminates on the landscaped easement between street and sidewalks in front of residences. Carry pick up bags and try to remove solid waste, but cannot always reach it. Many residents also treat the easement as a continuation of their property landscape. Some residents walk their pets in street and dodge the vehicles by stepping on to the easement. (I don't "dodge" very well with Doberman Pinscher) Know this is a rudimentary question, but has anyone experienced this and have a safe suggestion? This has been an upper middle-class area of Hillsborough County for 35-40 years with three homeowners associations. 24 If the sidewalk width is wider than 4 feet, let say 10' in a commercial area, could we have unmarked 4' wide accessible path (2% max. cross-sloped) and the remained width within more than 2% and less than 5% cross slope? 25 As the Traffic Control Supervisor for our City's Department of Transportation, in the State of Ohio, I get requests to install pedestrian crossing signals at signalized intersections that do not have curb ramps. It is my understanding that if I do install said signals, I am required to install ramps and crosswalk markings. What are my legal liabilities if the City does install pedestrian signal heads where ramps currently do not exist? 26 Is there a reason that there is not a minimum length for a median/pedestrian refuge? It seems like this area should be at least 4' to store a wheelchair so that it does not protrude into adjacent roadway traffic lanes. 27 R302.6.1: Why is up to 5% cross slope for street crossings that are not yield or stop controlled allowed?